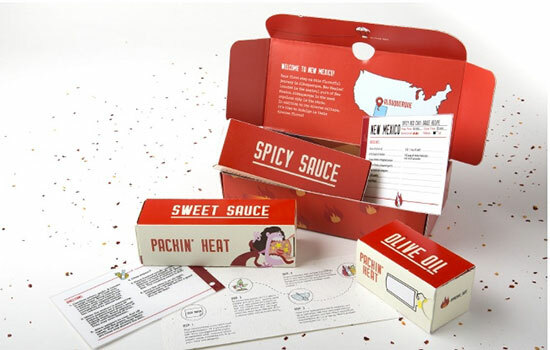 Packin’ Heat, a student-designed subscription box of flavored hot sauces, was the winning entry among 58 collegiate design entries at the recent Student Design Challenge sponsored by the Paperboard Packaging Alliance. RIT’s “Packin’ Heat” student team was a spicy favorite at the 2018 Paperboard Packaging Student Design Challenge. The group of undergraduates from Rochester Institute of Technology took first place among 58 collegiate teams in the national design competition. It was the second year RIT won the overall competition taking place at the annual 2018 PackExpo trade show and conference in Chicago in early October. 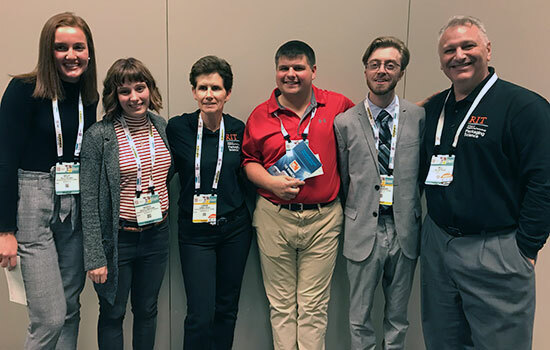 A second RIT student team, Venture Box, was runner-up in the national competition where students are recognized for their creative and sustainable package designs. The challenge has been integrated into a multi-disciplinary course, Packaging Design, a long-time collaboration between RIT’s College of Engineering Technology (CET) and the College of Art and Design (CAD). Each year’s projects are different, and once completed all student work is entered for the challenge. This year’s project to design subscription boxes entailed designing prototypes in three product categories: health and fitness products, healthy snacks and condiment sauces. Subscription boxes are filled with merchandise specific to a customer’s interest, home-delivered and part of a popular, growing market trend to encourage customer loyalty through convenience, specialized content and distinct, multi-use packaging. Six teams, consisting of 23 students from RIT’s graphic design, industrial design and packaging science programs, worked to understand how designers and packaging professionals collaborate to influence a company’s brand and bottom line. Hands-on work throughout the semester included learning skills in project management, packaging structural design, printing prototypes, developing market reports and incorporating sustainable materials in product development. Team Kan-Do created Packin’ Heat, a collection of hot sauces from across the globe. “We wanted people to travel around the world with their taste buds,” said Andrew McMahon, a graphic design major from Yucca Valley, Calif. Contents of the Packin’ Heat subscriber box include three to five hot-to-sweet flavored sauces, recipe cards and supplemental condiments such as oil and vinegar blends at “a mild price compared to competitors,” McMahon added. Beyond a well-executed package design, the students created a series of interactive graphics that accompanied an ingenious instruction card printed on “plantable” paper and embedded with a packet of chili pepper seeds for each sauce theme. These were key design elements called out by the judges for this winning design, said Bill Wynkoop, adjunct faculty in the packaging program in CET. Each team details its design process to industry judges—its inspiration, the competition making similar products and the decisions made to develop unique prototypes that consisted of larger, branded subscription mailers with different content packages made of cloth pouches, unique bottles or puzzle-boxes—all able to be multi-use, either to display items or as keepsakes. RIT has participated and had top placements in the competition since the design challenge began in 2005. Design challenge competitors represented 13 colleges and universities including RIT, Michigan State University, Rutgers, San Jose State University, Indian State University, the Fashion Institute of Technology, San Jose State, Indiana State and Clemson Universities. Team Kan-Do is Dylan Fisher, Kelly Fellner, Nicole Langford and Andrew McMahon. For first place, the students will share the $5,500 prize and RIT will receive $5,000. Venture Box is Sydney Ryan, Madison Griebel, Karley Allis and Samantha Herman. Students on the design team Tea Forte sought to expose customers to different cultures through distribution of International Tea Boxes. Four times per year customers would receive select teas from around the world, packaged in individual boxes with different designs to represent the country. Tea is more than a drink, it is an experience, said the designers; part of their package would include the history of the tea and background information about the country of origin. Team Scout designed the Venture Box for hiking enthusiasts, environmental conservationists and adventure seekers. Complete with different types of energy bars along with wearables such as a scarf that can be converted and used as a rope—in case of emergency—the team believed the Venture Box would be a viable competitor in the extreme sports landscape. Team Trio’s On-the-Go-Snacks design would provide healthy snack packages for individuals looking to curb cravings while dieting or to provide an alternative to vending machines in the workplace. Contents include a variety of snacks in colorful packaging, based on individuals needs such as calorie intake, and scalable for active families. Team Origin designed a Sport/Fitness Box for the fitness adventurer who wants to try new outdoor sports such as orienteering, snowboarding or ultimate frisbee. Filled with sunscreen, T-shirts and energy bars as well as items specific to the sports, the Fitness Box would also include information about the sports’ communities and links to a “meet up” app for different cities. Team Potion’s subscription box was filled with Natural Beauty products and focused on skin care versus make-up to differentiate it from competitors in the field so that clients would “feel comfortable in their own skin with no need for layering up,” said Emily Barclay, a packaging science student from Fayetteville, N.Y. The team’s advantage would be to provide full size products rather than the sample sizes some of their competitors do and options to combine different natural ingredients for individualized products. Outside of the subscription service, the team also wanted to venture into different markets such as select department stores and as courtesy items in hotels. Team winners are (from left) Kelly Fellner, Nicole Langford, Lorrie Frear, Dylan Fisher, Andrew McMahon and Bill Wynkoop.